When my visual learning daughter was in high school, she had trouble learning scientific notation. This is the conversion of LARGE NUMBERS to smaller numbers with exponents. She could never remember which way to move the decimal and whether the exponent was a positive or negative. 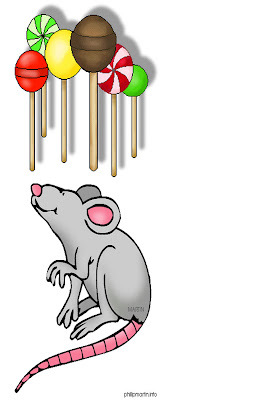 So I explained it to her using lollipops and rats. The word lollipop starts with an l as does the word LEFT. Lollipops are also a positive thing. The word rat starts with an r as does the word RIGHT. Rats are usually a negative thing. (Don't be fooled with the cute picture above. He was just a cute image to get to this blog about MATH). So, I told her the story about how a scientist is taking notes in shorthand to count MILLIONS of cells. He was driving to the lab one day on the highway. He noticed that the exit signs were placed on the road name signs on either the left (for a left hand exit) or on the right (for a right hand exit). He compared this idea to exponents and was excited about explaining this to his class of future scientists. The exponent is nine because we moved the decimal point nine places. It is positive because we went left past the lollipop store. The exponent is -5 because we moved the decimal point five places to the right. It is also negative because we went RIGHT past a RAT.